Did you know there are over 1800 active startup companies operating in Berlin? 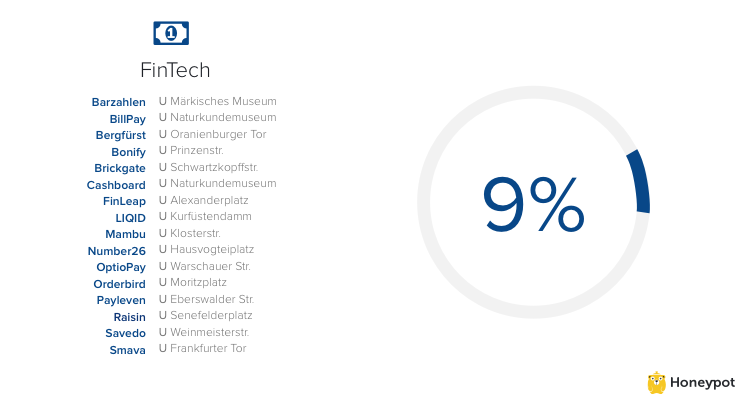 To discover more about them, we took a 10% sample sorted them by industry and mapped them by U-bahn station. The following post details our findings. According to EY, in 2015 growth in Germany outpaced other European tech regions such as the UK, Sweden or France. With Berlin centered at the beating heart of this growth and home to roughly 1,800 active tech startups, analysts estimate that the city’s startups could create between 40,000 and 100,000 new jobs by 2020. Our research reveals 56% of Berlin’s startups are in the former east of the city, clustered around the famous Torstrasse, otherwise known as Silicon Allee. Pockets of startups can also be found huddled in hubs around Prenzlauer Berg (former East Berlin) and Kreuzberg (former west Berlin). Both of these neighbourhoods once bordered the Berlin wall making loft space in desinstrualized buildings affordable and attractive. Berlin’s startups are largely heterogeneous and many escape easy classification. Our sample showed that eCommerce and AdTech dominate, while FinTech, retail technology and marketing solutions also have significant representation. 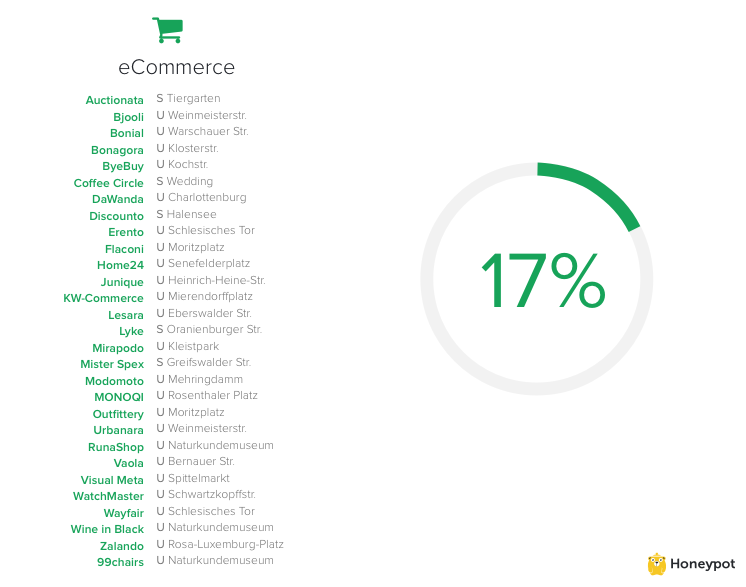 17% of our sample are eCommerce companies. Zalando, Berlin’s most famous eCommerce startup, was founded in 2008 by Robert Gentz and David Schneider. 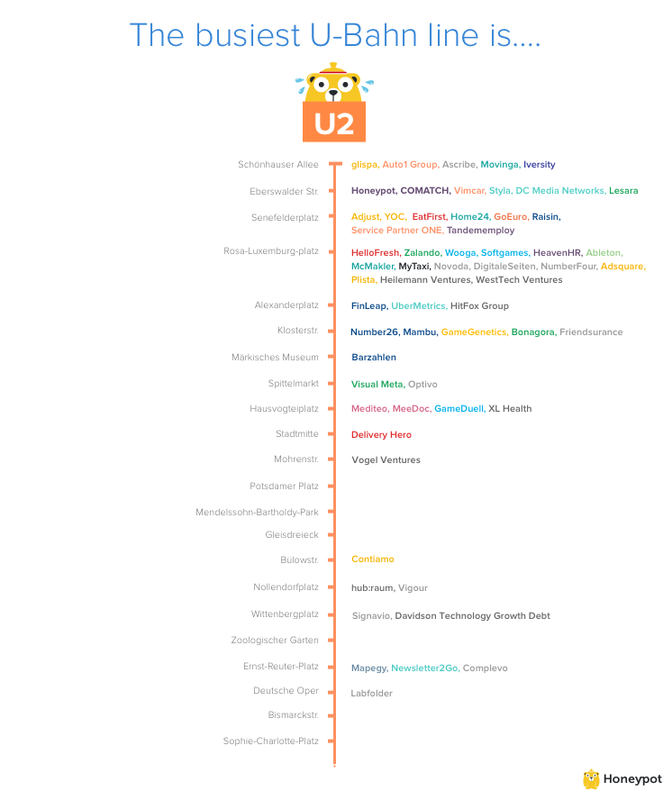 In Autumn 2014, Zalando IPO’d to the tune of €5.3 billion. Spurred by Zalando’s success, Berlin’s eCommerce landscape today is varied. It’s possible to find companies specialized in the sale of classic car parts , luxury watches, perfume, glasses and many other niche items. Companies are also playing with the business model, trying out new forms of ownership and service. ByeBuy, for example, are offering phones, gaming consoles and other products on a pay as you go basis, while Outfittery and Modomoto offer personal stylists to assist in sartorial decisions. Following on from eCommerce, AdTech startups had the second biggest representation amongst our sample (11%). 2014 was a breakthrough year for Berlin’s AdTech firms, with a number of players, such as Adjust, Remerge, AdSquare and Fyber, successfully exiting or securing funding. Many point to the legacy of HitFox Group, the company builder focused on AdTech and big data, which acquired or helped to launch companies like AppLift and ad2games, to explain the high concentration of AdTech startups in the city. 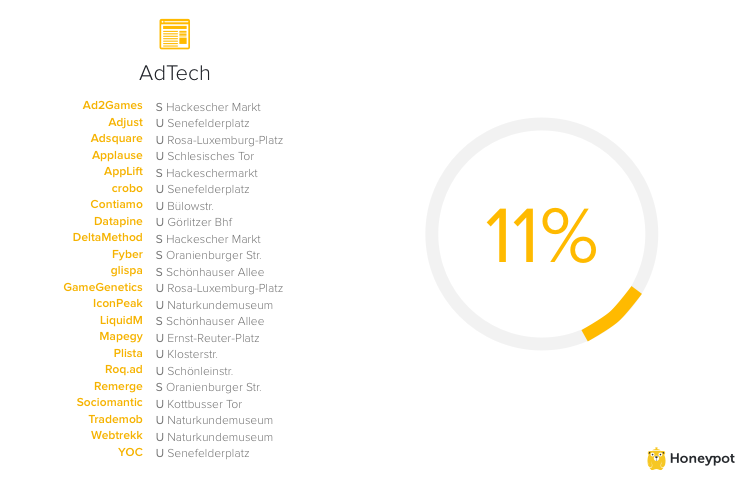 Berlin has consolidated its position as Europe’s AdTech hub. According to eMarketer, mobile ad spend will top $100 billion in 2016. Despite this, competition in the city is fierce and Berlin’s AdTech industry will likely see consolidation in 2016, similar to what has been seen internationally. The third most common industry in our sample is FinTech. 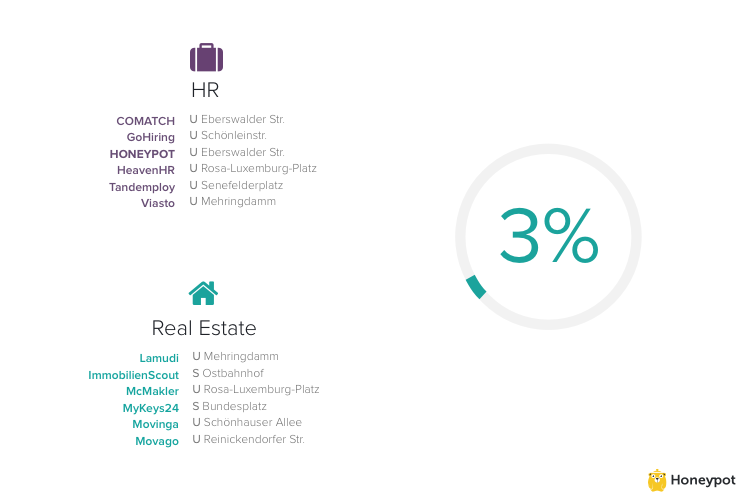 9% of our sample can be classified as FinTech companies. In 2014, the DACH region (Germany, Austria, Switzerland) attracted the second largest amount of FinTech funding in Europe after the U.K.
Germany’s bureaucratic and low-tech banking system leaves space for FinTech companies to seize opportunities. Number26 is one of the city’s hottest startups, which young tech-savvy clients preferring the branch-free approach to banking. Berlin is also home to the world’s first FinTech incubator, FinLeap, which was founded in 2014. While retail technology is still relatively new, the recent proliferation in the US of mobile point of sales solutions, inventory software and location based technology to guide on-site shopping, has inspired many in Berlin. 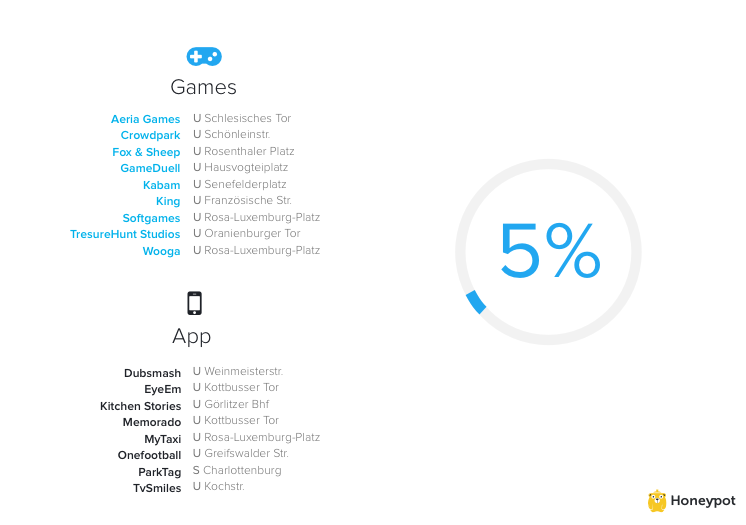 KaufDa is one of Berlin’s earliest pioneers of retail technology - the site allows consumers to search for the best sales and mobile couponing running near where they live. In 2011 Axel Springer bought a 74.9% stake for a reported USD$40 million. While retail tech is still underdeveloped, market interest is beginning to grow and Berlin startups will no doubt be part of the fun. This year it represents 6% of our sample. Sometimes referred to as MarTech, this industry in its broadest sense can also encompass BI, analytics, AdTech and even eCommerce. Our definition focuses on marketing operations, including areas such as cross channel marketing, content solutions, email marketing and lead generation tools. According to Venture Beat, marketing technology startups have secured $134 billion in venture funding in the last five years. Zanox is one of Berlin’s most successful MarTech startups. Formed in 2000, the affiliate marketing superstar today has over 800 employees in 11 offices across the globe. The remainder of our sample is heterogeneous, split across various industries, including Games, Mobile Apps, Health, EduTech, Food Delivery, Travel, Real Estate, HR, Service, and other. Food startups are in a fierce battle for control of the city’s takeaway consumers. Delivery Hero, an online food and beverage-ordering service operating internationally in 29 countries, is the champion of Berlin’s food delivery startups and one of the city’s “unicorns”. 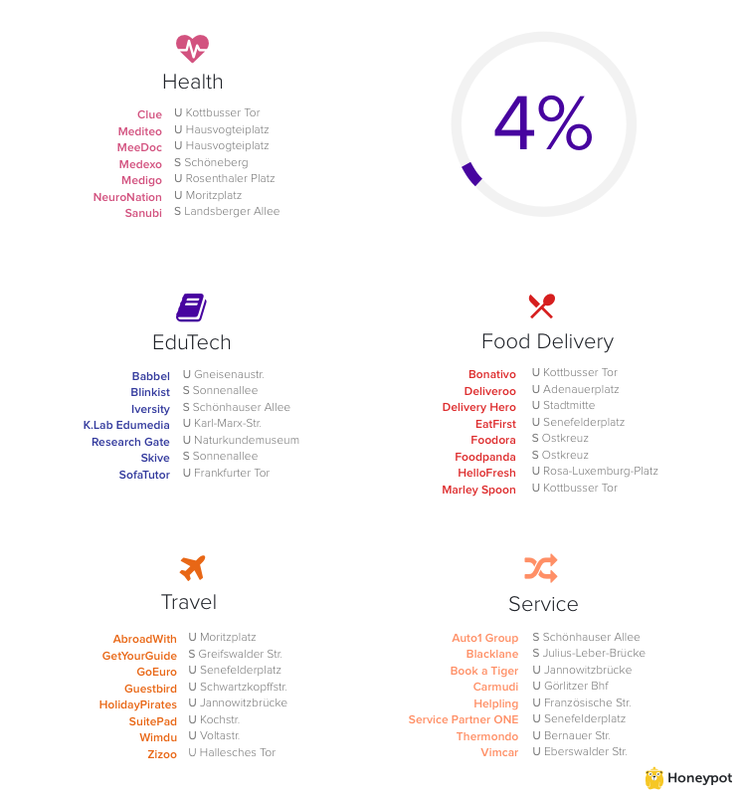 2015 was a positive year for Berlin’s travel startups, with two bumper financing rounds back to back. Travel planner platform GoEuro raised $45 million in December 2015, in a Series B round led by Goldman Sachs, while GetYourGuide raised $50 million one month earlier. HR tech startups are addressing some of the most consistently-felt problems by businesses: payroll, compliance, recruitment and talent management. At Honeypot we are on a mission to make tech recruitment more efficient and more transparent. Others in the city, such as GoHiring, are looking at clever ways to automate job postings. Berlin is home to a number of high profile gaming startups, such as Wooga, which contribute to the success of the online, social network and browser games developer here. Berlin games companies now export their games to over 50 countries worldwide. 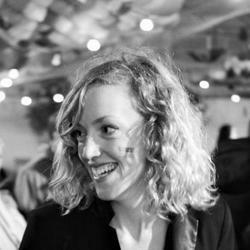 Growth of startups in Berlin has traditionally been hampered by a lack of funding. However, over the course of 2015 and early 2016, approximately 15 new $50M+ early stage VC funds based in Berlin have been raised or incepted. Combined with increased engagement from international investors such as Baillie Gifford, Goldman Sachs, DST Global and others, a self-nurturing ecosystem is beginning to emerge. Berlin is also home to a number of interesting accelerators, incubators and company builders, creating a thriving and supportive environment for budding entrepreneurs. Rocket Internet is undoubtedly the most famous company builder from Berlin and one of the city’s largest employers. Founded by the three Samwer brothers, the incubator, which runs a company cloning business model, was valued at €6.5 billion when it IPO’d in 2015. Rocket has invested in or launched some of Berlin’s biggest companies, including Delivery Hero, Zalando and Wimdu. Some other notable examples of incubators and accelerators include Factory, which partners with Google to provide events and training, Microsoft Ventures, hub:raum, and Axel Springer Plug and Play. As for coding bootcamps and schools, Berlin’s Spiced Academy, is leading the pack, offering intensive fullstack web development and data analytics courses, from its airy loftspace in Schöneberg. Berlin’s low cost of living and creative culture has attracted national and international tech talent but more recent increases in the cost of living and the demand for apartments generally means securing your spot in the right location can be quite a battle. This begs the question where is the best place to live in Berlin if you want to work in a startup? Well, the answer is anywhere along the U2 U-bahn line. 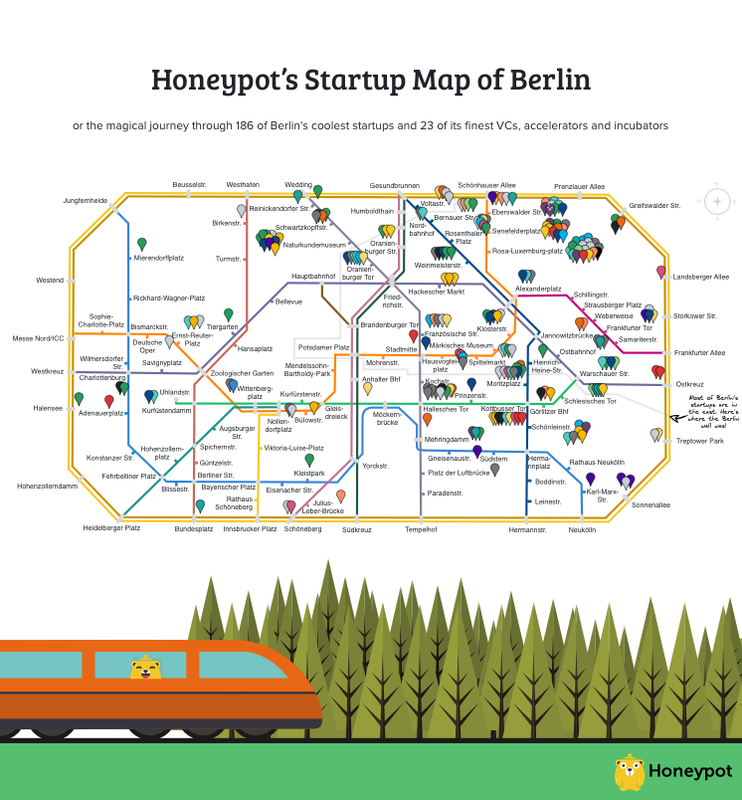 A whopping 38% of Berlin’s startups are along this line which runs from west to east across the city. At Rosa Luxemburg Platz alone, which lies close to the famous Silicon Allee, we counted 13 startups. How did we define each industry? Other: Some startups just escape definition!